Hon. Melanie Cyganowski (Ret. ), former Chief Bankruptcy Judge, EDNY; Member of Otterbourg P.C., will be presented with the Twelfth Annual Honorable Cecelia H. Goetz Award. The Honorable Cecelia H. Goetz Award, United States Bankruptcy Judge, E.D.N.Y. (1917 – 2004)The first woman bankruptcy judge appointed in the Eastern District of New York, Judge Cecelia H. Goetz led a life that reflected a story of “firsts” and, in so doing, laid a foundation which enabled others to follow in her footsteps. Jil Mazer-Marino, Member of Meyer, Suozzi, English & Klein, P.C., will be presented with the Twelfth Annual Executive of the Year Award. The NYIC Women’s Division Executive of the Year Award recognizes excellence in entrepreneurial spirit. The award is presented to those individuals who have achieved noteworthy success in business and who have assisted other women in achieving their goals. 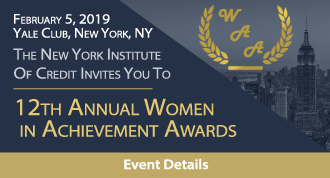 By acknowledging excellence in business, leadership, and a commitment to fostering the growth and success of other women in business, the NYIC Women’s Division hopes to inspire women to succeed and to help other women achieve success in business and in life. Lori Lapin Jones, Member of Lori Lapin Jones PLLC, will be presented with the Fourth Annual Renaissance Award. The NYIC Women’s Division Renaissance Award recognizes discovery and exploration in the ever-changing business world. The award is presented to those individuals who have served as trailblazers in the business community by dedication to continued learning, community service, mentor ship and developing new business and leadership opportunities of others.